Operation and theory of the alternator, explained in simple terms. "What does that little red light that says ALT mean when it comes on?" Very basically, it means that either the alternator output voltage is lower than the battery voltage, or the battery voltage is lower than the alternator output voltage. If the light gets dimmer as you rev up the engine, then you most likely have a problem with the alternator. If it gets brighter, then the battery is most likely bad. That's all well and good, but just exactly what does all that mean? 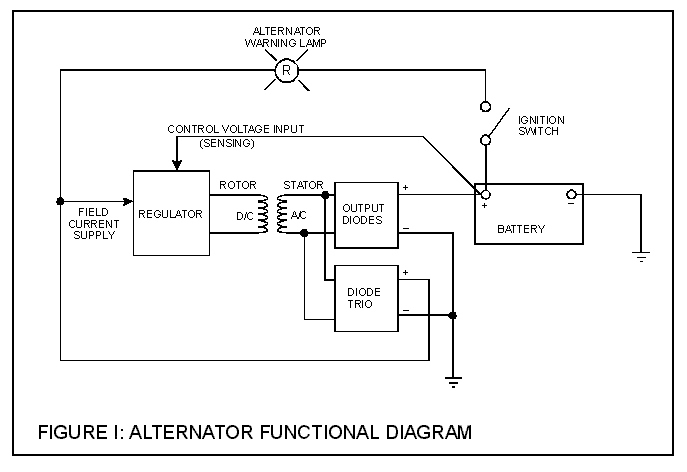 To get a good idea, it is first necessary to understand how an alternator works. You don't need an engineering degree, just a basic understanding of the general principles. We'll start our tour of the alternator where it all starts in the alternator itself - at the alternator rotor. The rotor consists of a coil of wire wrapped around an iron core. Current through the wire coil - called "field" current - produces a magnetic field around the core. The strength of the field current determines the strength of the magnetic field. The field current is D/C, or direct current. In other words, the current flows in one direction only, and is supplied to the wire coil by a set of brushes and slip rings. The magnetic field produced has, as any magnet, a north and a south pole. The rotor is driven by the alternator pulley, rotating as the engine runs, hence the name "rotor." Surrounding the rotor is another set of coils, three in number, called the stator. The stator is fixed to the shell of the alternator, and does not turn. As the rotor turns within the stator windings, the magnetic field of the rotor sweeps through the stator windings, producing an electrical current in the windings. 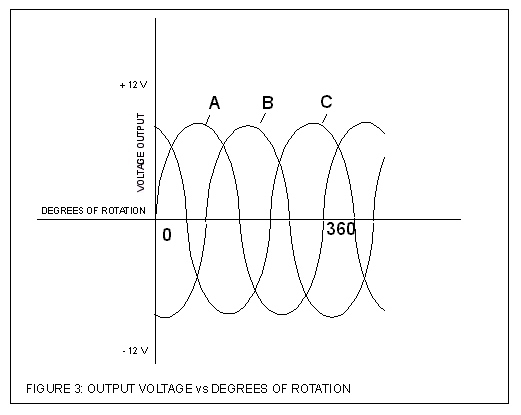 Because of the rotation of the rotor, an alternating current is produced. As, for example, the north pole of the magnetic field approaches one of the stator windings, there is little coupling taking place, and a weak current is produced, As the rotation continues, the magnetic field moves to the center of the winding, where maximum coupling takes place, and the induced current is at its peak. As the rotation continues to the point that the magnetic field is leaving the stator winding, the induced current is small. By this time, the south pole is approaching the winding, producing a weak current in the opposite direction. As this continues, the current produced in each winding plotted against the angle of rotation of the rotor has the form shown in figure 2. The three stator windings are spaced inside the alternator 120 degrees apart, producing three separate sets, or "phases," of output voltages, spaced 120 degrees apart, as shown in Figure 3. A/C voltage is of little use in a D/C system, such as used in an automobile, so it has to be converted to D/C before it can be used. This conversion to D/C takes place in the "output diodes" and in the "diode trio." Diodes have the property of allowing current to flow in only one direction, while blocking current flow in the other direction. The output diodes consist of six diodes, one pair for each winding. One of the pair is for the negative half cycle, and the other for the positive half cycle. As a result of this diode rectification, the output of the alternator looks as shown in Figure 4. Surprisingly enough, the output of the alternator is not a pure D/C as one might expect, but a pulsating D/C. Because there are three windings, each with a positive and a negative half, by the time the voltage is passed through the diodes, there are six pulsations for each rotation of the rotor. This is close enough to D/C for most automotive components. Critical components, such as radios, have their own internal filtering circuits to further smooth out the waveform to a purer D/C. The diode trio consists, as the name suggests, of three diodes, one per phase, which provides field current to the alternator regulator. This output will be discussed in more detail later in the "field current supply" section. The regulator has two inputs and one output. 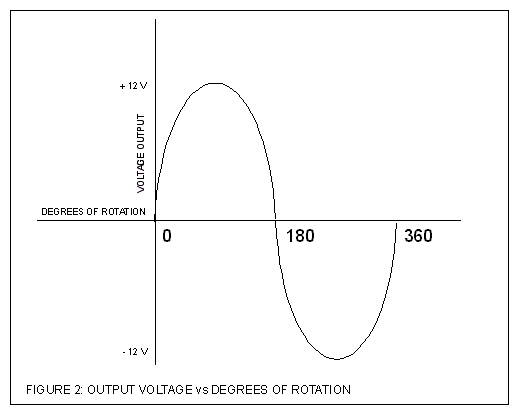 The inputs are the field current supply and the control voltage input, and the output is the field current to the rotor. The regulator uses the control voltage input to control the amount of field current input that is allow to pass through to the rotor winding. If the battery voltage drops, the regulator senses this, by means of the connection to the battery, and allows more of the field current input to reach the rotor, which increases the magnetic field strength, which ultimately increases the voltage output of the alternator. Conversely, if the battery voltage goes up, less field current goes through the rotor windings, and the output voltage is reduced. Field current supply is provided from two different sources - from the alternator itself, via the diode trio, and from the battery, via the alternator warning lamp. When you first get in the car and turn the key on, the engine is not running and the alternator is not spinning. At this time, the voltage/current source for the field current is from the battery, through the ignition switch, and through the warning lamp. After the engine is started, and the alternator is up to speed, the output of the diode trio is fed back to the regulator, and serves as a source of current for the field current. At this time, the alternator is self sustaining, and the battery is no longer needed to power the automobiles electrical system. WARNING!!! This is theoretical only - in actual practice, the voltage surges resulting from disconnecting the battery can seriously damage the regulator circuitry. All alternator manufacturers strongly advise NOT doing this! This test will not prove the functionality of the alternator anyway, as the engine may still run with a weak alternator output. This brings us back full circle to the starting point - the alternator warning light. 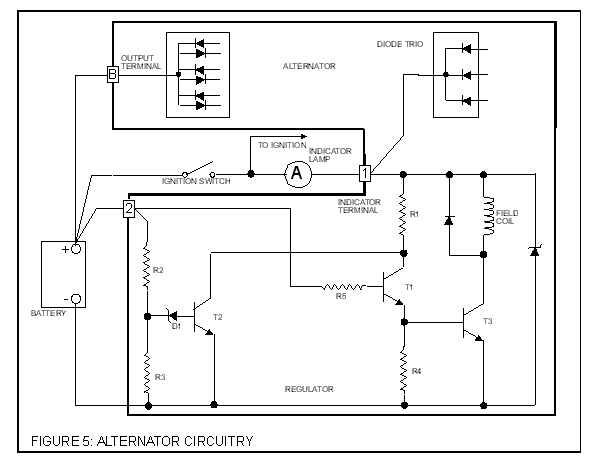 As can be seen from figure 5, a schematic for an actual alternator, there is a path to ground from the field current supply input  to the regulator. As a result, when the key is turned on, current flows through the warning lamp, through the resisters, transistors, and field coil, and then to ground, causing the lamp to illuminate. Once the alternator is at full output, voltage from the diode trio, also applied to , equals the battery voltage. At this time, with 12 volts on both sides, the lamp is out. If the alternator should fail, voltage from the diode trio would drop, and once again the lamp would light from the battery voltage. If the alternator output is only a little low, the lamp will be dimly lit. If the alternator fails completely, and the output voltage goes to zero, the lamp will be lit at full brilliance. Conversely, if the battery should fail, and the battery voltage drops, with the output voltage of the alternator on one side and the low battery voltage on the other, the lamp will also light. As stated earlier, if the light grows dimmer as the engine is revved up, it is because the alternator voltage is rising with the RPM, producing more voltage on the alternator side of the lamp. The closer the output voltage gets to the battery voltage, the dimmer the bulb becomes. By the same way, if the light gets brighter with increasing RPM, it is because as the alternator voltage increases, it is getting higher than the battery voltage. The higher the voltage with respect to the battery voltage, the greater the voltage difference across the lamp, and the brighter it gets. In summary, then, we can say that field current through the rotor coils produces a magnetic field, which is coupled over to the stator coils, producing an AC voltage. 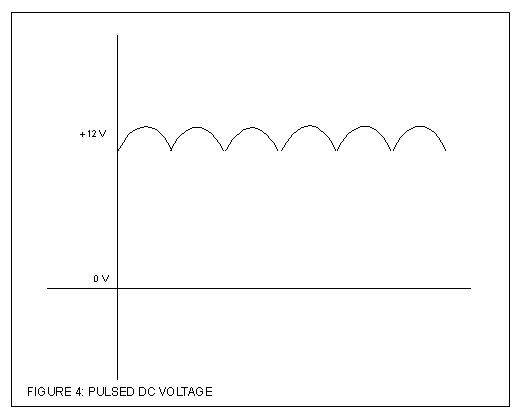 This AC voltage is converted by the output diodes into pulsating DC voltage, which charges the battery. The field current is supplied from either the battery, via the warning lamp, or from the diode trio. The amount of field current allowed to pass through the regulator to the rotor, or field coil, is controlled by the voltage feedback from the battery. And there you have it - the complete operation of an alternator in a nutshell. The next time you see the little red light, you will know exactly what it is trying to tell you. line between the alternator and the ignition light. the brown wire on the ignition relay the light does not go back on.